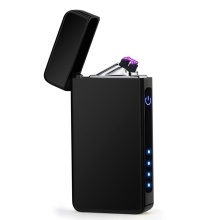 This cigarette tool adopts intelligent induction double arc, fingerprint ignition. Rechargeable, upgrade chip, management more secure and stable. Electric quantity display, intelligent induction double arc. Upgrade chip, management more secure and stable. Intelligent compatibility, notebook, car, charging treasure, socket and so on all can charge.